Why Is Amazon Blocking Competitive Browsers on Kindle Fire? Amazon seems to be blocking competitive browsers like Skyfire, Opera, Firefox and Dolphin on Kindle Fire. Amazon suggests the Android apps when you search for them, but when you click on the apps, they are nowhere to be found in the store for download. Amazon essentially teases you with the apps, but makes it nearly impossible to access them, which we think is incredibly sleazy. The native browser on the Kindle Fire, Silk, is powered by Amazon Web Services. Amazon introduced the browser back in September and touted it as: "Extending the boundaries of the browser, coupling the capabilities and interactivity of your local device with the massive computing power, memory, and network connectivity of our cloud." Dolphin, on the other hand, lets you search using gestures and offers webzine-based browsing. In October, the company added Dolphin Connect to enable storage of add-ons and preferences on the cloud. Online, Amazon advertises that Dolphin is available for your Android device but not compatible with the Kindle. To try to get around this, we went to settings to enable third-party downloads. See screen shots below for directions on how to do this. When you enable this function, the Kindle warns you that doing so means that your data is less secure and that there is a risk of unexpected behavior. "You agree that you are solely responsible for any damage to your Kindle or loss of data that may result from using these applications," the warning reads. LAUNCH has contacted Amazon and will update this story if we receive a response. We then proceeded to Amazon.com to install the app from the website. After "purchasing" the free browser, the Amazon page stated, "Open the Amazon Appstore for Android on your device to download and install your app." Still, the app was nowhere to be found. 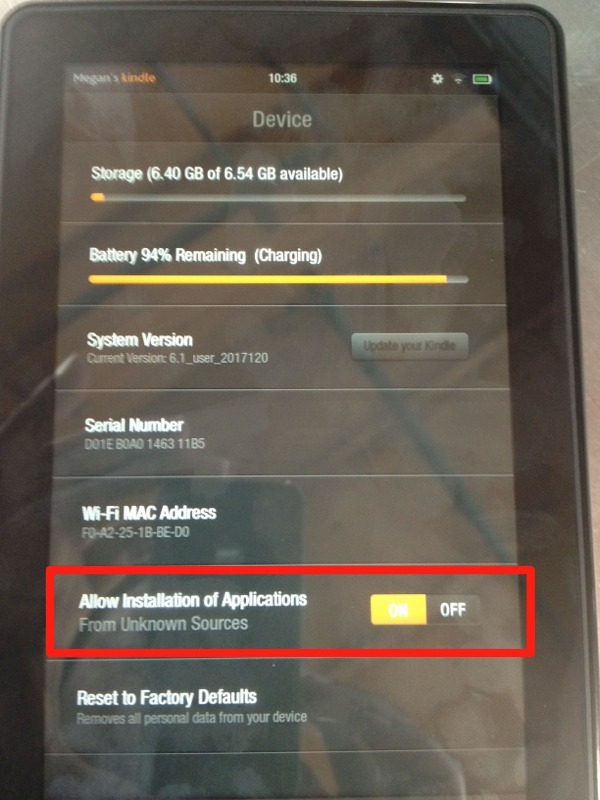 The trick seems to be sideloading, which is the process of installing apps via USB from your computer. However, sideloading could potentially void your warranty. We are currently trying this technique and will update this story when we have the results. It's surprising that Amazon would make it so difficult to access third-party apps. Even super-controlling Apple lets you download and install third-party browsers, so why won't Amazon? The Amazon Kindle Fire, which sells for $199, is a 7-inch tablet that runs on the Android 2.3 (Gingerbread) operating system. The suggestions show up but it's not possible to download the Dolphin browser. To allow third-party applications installations, click the gear in the top-right corner and then scroll down to "Device." In the Device tab, click "On" to allow third-party application downloads. Technically, the app should be available for download on the Kindle, but it's not.